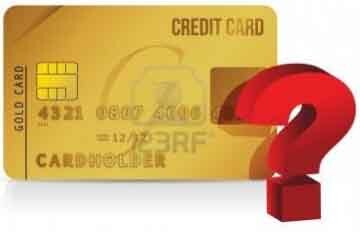 Should I get a cashback or a miles card? I started writing a quick reply but it quickly got more involved with examples so I wanted to make this into a more comprehensive post that I could refer people to in the future since this is a common question. This is a long post, but read and digest it slowly because it is an important one. If you don’t want all the details, skip to the bottom to the Conclusion TLDR section. Author John ButlerPosted on October 20, 2014 June 8, 2018 Categories Amex Business Gold Card, Amex Membership Rewards, Capital One Venture Rewards, Chase British Airways, Chase Ink Plus, Chase Sapphire Preferred, Chase Ultimate Rewards, Citibank AA Platinum Personal Mastercard, Discover It2 Comments on Should I get a cashback or a miles card? TWM, Take Me Away to the World Cup 2014 for free! World Cup madness is upon us and I wanted to see what last minute trips were available with miles to get you to Brazil. Since the matches are scattered around Brazil over a large timeframe, this was a perfect opportunity to come up with some creative frequent flyer tickets! 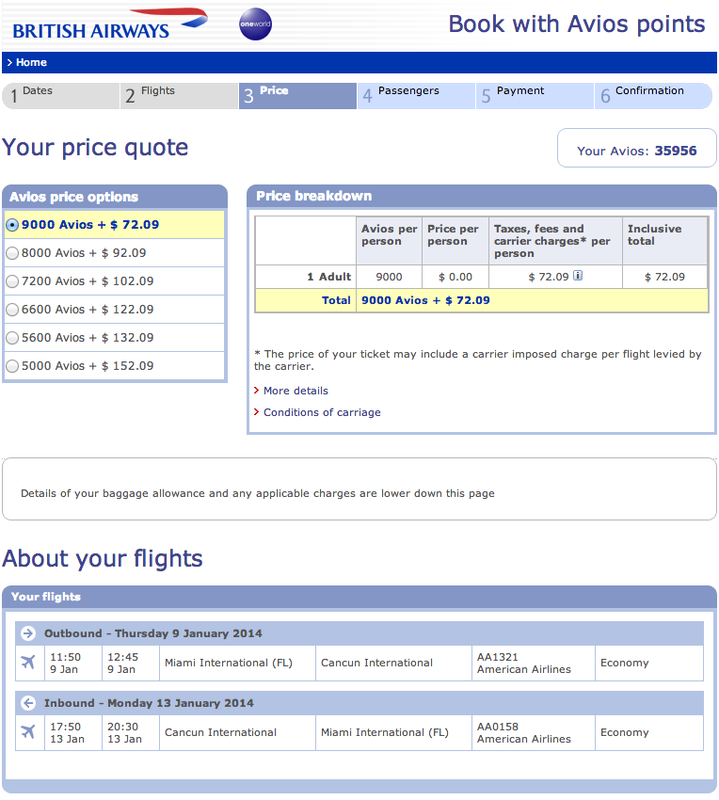 Here are some of the options I found using my article on How to Search OneWorld availability using Quantas.com. Once I found available flights I priced them out following the article on How to book OneWorld flights with British Airways Miles. British Airways is a transfer partner of Ultimate Rewards. You can transfer miles earned from the 40,000 point bonus of the Chase Sapphire Preferred, or the 60,000 point bonus of the Chase Ink Bold, or the book directly with 50,000 Avios bonus of the Chase British Airways card. There is TONS of availability for this city. You could use this as a jumping off point for many of the other cities. To keep things simple (and the milage costs down), I am only going to focus on the non stop available awards. 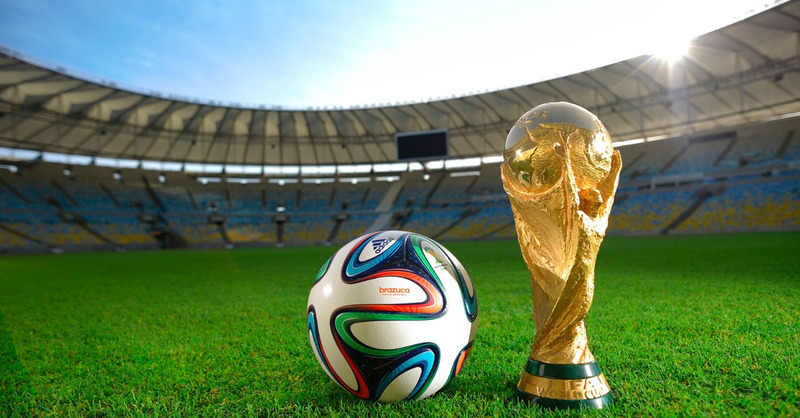 For just 50,000 Avios + $88 you could fly down from Miami and see three world cup matches! For those of you not in Miami, British Airways may not be the cheapest option (but it probably still will be), so check out the American flights for 60,000 AA or US Airways Miles and $118 from anywhere in the continental US. 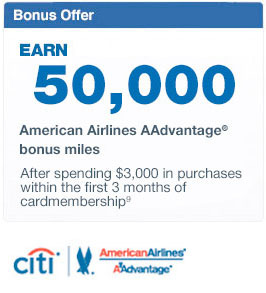 The Citibank AA Mastercard currently has a 50K sign up bonus and the US Airways Card has a 40K bonus after spending $1. You would just need to find connecting flights from your city to Miami where there are award seats using the tools we linked to above. For the non stop there is only availability after the USA match but you could see the first match of the Round of 16. You could spend the rest of the time on the beautiful beaches of Recife! For only 40,000 Avios (the same amount as the sign on bonus for the Chase Sapphire Preferred) + $88 you could see this historic match! You could do the same thing from anywhere in the US for the higher price of 60,000 AA miles + $118. How does this sound for the ultimate long weekend? Fly into Rio on Thursday night, July 3, arrive at 5 in the morning on July 4, attend the quarter finals that day at the famous Estádio Maracanã, then celebrate through the weekend in Rio then fly back out on Sunday July 6. For only 50,000 Avios (the exact amount of the sign up bonus on the Chase British Airways Visa) or 60,000 American Miles, you can do it! And there are two seats available so you can take a friend with you! You can’t make the Colombia match unfortunately for the cheapest miles price, but you can make it for 3 matches including the Quarter-finals in the amazing city of Brasilia for only 40,000 Avios (which you could get from the sign up bonus of the Chase Sapphire Preferred) and $91! Like the other options you could travel from anywhere else in the US using 60,000 American miles once you find your connecting flights to Miami. For just 40,000 Avios and $88 you can leave in two days and see Argentina, Costa Rica, and England play, and also catch the first round of 16 match in Belo Horizonte, one of the most beautiful cities in all of Brazil! As with the others, 60K AA miles is also an option if you aren’t located in Miami. I have so many Colombian Friends I had to include an option to see your match vs Japan in Cuiabá, Brazil on June 24. Since Cuiabá is such a small airport, I couldn’t find frequent flyer seats there so you would need to buy a ticket from Sao Paulo to there for $78. You could then buy another $65 ticket from Cuiabá to Brasilia to catch your frequent flyer ticket back from there. This gives you a total cost of 45,000 Avios and $234. Which still isn’t too bad to see your country play in the world cup! A better option might be to predict where they will play in the Round of 16 and go there since I am sure they will be making it through! You would still need hotels and tickets to the games but there are a ton of options available to you when you get the flights there for cheap. Using the tools I have provided above you can look for the flights and cities that match up with your favorite teams. That Rio option is looking awfully tempting to me. I think those two seats are going to go quickly once this article is published! Feel free to comment on what other good options you found and tell me which matches you think would be the best to watch! As always, reply with any questions and follow me on Google+, Facebook, Twitter and Instagram to make sure you don’t miss any great info! Author John ButlerPosted on June 16, 2014 June 20, 2014 Categories American Airlines AAdvantage, British Airways Avios, Chase British Airways, Chase Ink Bold, Chase Sapphire Preferred, TWM Take Me Away!Leave a comment on TWM, Take Me Away to the World Cup 2014 for free! 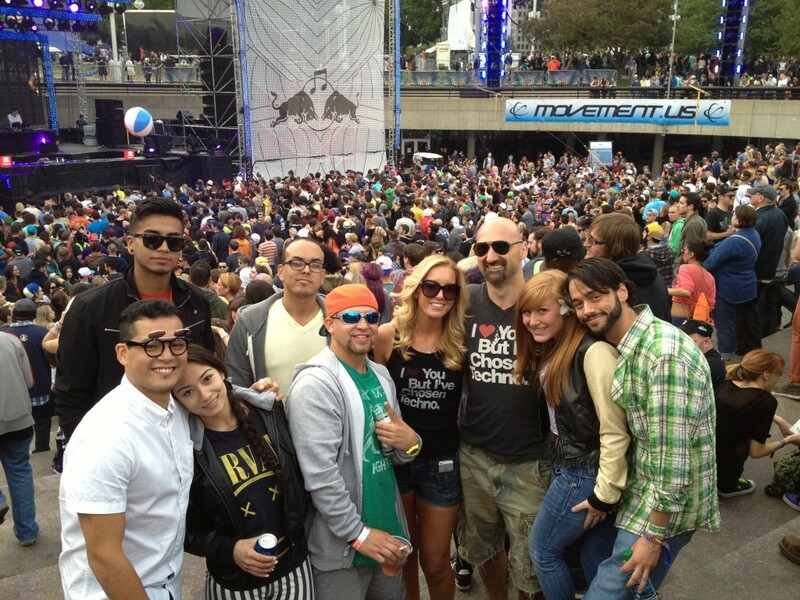 One of my favorite festivals I attend each year is the Movement Festival in Detroit over Memorial Day weekend. I truly believe it is the best techno focused festival in the US each year. Last year I went with a friend to Detroit for only $10. Since this is the next big festival many of my readers are thinking about attending, I’m going to show you what you can do now to get free flights there from Miami (but many of the options should apply wherever you are coming from). 1. Pay cash for the plane ticket. Current prices are $218 (departing Friday, May 23) or $240 (Departing Saturday, May 24) on Delta Airlines. This obviously isn’t a free option, but I wanted to include it so you can compare its cost to the other options and see what value you are getting for the points you are redeeming. 2. Use part of the 40,000 Mile Bonus of the Barclaycard Arrival PlusTM World Elite MasterCard® to pay cash for the plane ticket. Value – 1.25 cents per mile. Apply for the Barclaycard Arrival PlusTM World Elite MasterCard® card and use 21,800 Miles of the 40,000 Mile sign on bonus to pay for a ticket. You will get an automatic rebate of 2,180 Miles (10%) back into your Arrival mileage account. You will get 2255 Skymiles since you are basically paying cash for the ticket as far as Delta is concerned. You could consider the true cost of this option as 21,800 – 2180 – 2255 = 17365 because of the rebates and miles you will earn. Read our full review on the Arrival Card here. Apply for the Chase Sapphire Preferred card and transfer 10,940 of the 40,000 point bonus to Southwest Airlines where you can book an award seat using those points. Read our full review on the Chase Sapphire Preferred Card here. Apply for the Chase Rapid Rewards Plus card and use 10,940 of the 50,000 point bonus to book an award seat using those points (same flights apply as the picture on option 3). Apply for the Chase Sapphire Preferred card and transfer 20,000 of the 40,000 point bonus to British Airways Avios where you can book an American Airlines award seat using those points. Read our article on how to book American Flights with British Airways Avios if you aren’t familiar with that process. Read our full review on the Chase Sapphire Preferred Card here. Apply for the British Airways card and use 20,000 of the 50,000 Avios Bonus to book an American Award seat using Avios (same flights apply as in option 5). Read our article on how to book American Flights with British Airways Avios if you aren’t familiar with that process. 7. Shop online with Rapid Rewards shopping to earn the 10,940 points needed for a Southwest Award flight. Value – unlimited if it is for purchases you would have made anyways. This will be the only option available for those without good credit since you can use your debit card or even a prepaid card. There are hundreds of merchants you can shop with and get points for every dollar that you spend. If you were planning on making these purchases anyways then you can end up with completely free points to redeem for your tickets! Some of the high earning merchants right now are 12 points / $1 at Magazines.com, 10 points / 1$ at Rosetta Stone, 7 points / $1 at Snapfish, 4 points / $1 at Advance Auto Parts, or 3 points / $1 at Groupon. If you aren’t familiar with how to make miles and points with online shopping, read our article on how to make mega miles shopping online! As you can see, the best value for your miles is in option 3 and 4, followed by option 2, then option 5 and 6. If you don’t have a lot of miles, then option 1 isn’t a bad choice while the fares stay low. As the fares go up, the free ticket options will go up in value. I personally will probably be using option 3 since I have so many Ultimate Rewards points. As always, feel free to comment with any questions and follow me on Facebook, Twitter and Instagram! 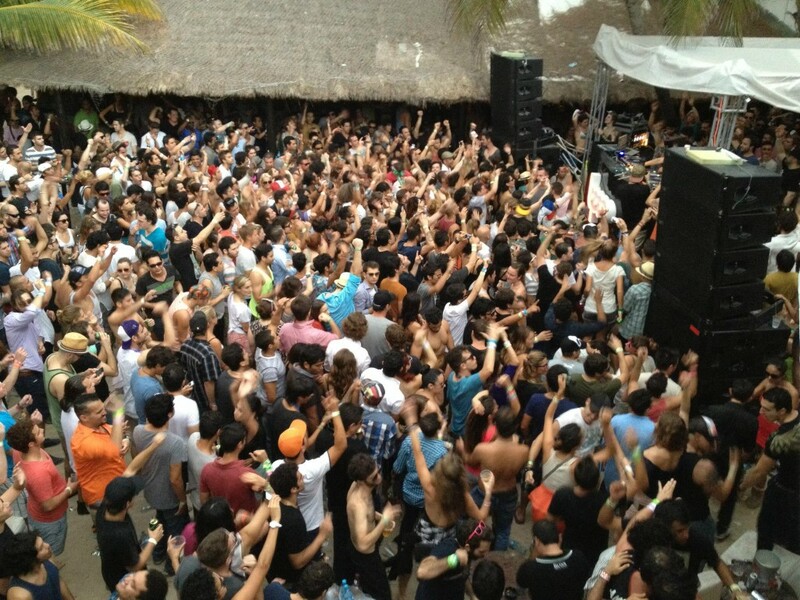 5 things you can do NOW to go to the BPM Festival for free. Update October 27, 2014: None of this has changed since I published this article in January so I am reposting it again for anyone who might want to go. By the time you read this, I will be on my way to Playa del Carmen, Mexico for the BPM Festival. This 10 day music festival brings all the best DJs from around the world into a beachfront community about an hour South of Cancun for day and night parties. I’ll start out with the Diynamic party with Solomun, then the Circo Loco party on Friday daytime, the Innervisions party on Friday night, All Day I Dream with Lee Burridge during the day, Music On during the night, then the closing parties on Sunday. Apply for the Chase Sapphire Preferred card and transfer 9,000 of the 40,000 Ultimate Reward sign up bonus to British Airways Avios and just pay the international taxes of $72. This is exactly how I got here this year and is truly the best use of your points if you are traveling from Miami. Check out our Full Review of the Chase Sapphire Preferred card here and find out why it is our #1 travel card for people who want to get started with already established credit. Get the Chase British Airways card and use 9,000 of the 50,000 Avios sign on bonus for the same ticket we listed above. If you play your cards right, you could even take 5 of your friends with you to BPM with this bonus! Read this article about how to book American flights with British Airways points which is exactly what I did. Apply for the Barclaycard Arrival card and use the 40,000 Mile sign on bonus (worth $400 in travel expenses) to pay for a ticket. This has the benefit of earning you miles for the flight as well since you are in essence paying for the ticket using the miles. The better use of this bonus would be for the hotel portion of your trip. Some friends and I are staying at the Fusion Hotel which is right in the middle of everything for 3 nights for around $400 total. This could be fully paid for with this sign up bonus! Get the Citibank American Airlines Platinum Personal Mastercard and use 35,000 of the 50,000 sign up bonus to book an American Award seat from anywhere in the US to Mexico. This option obviously pales in comparison to numbers 2 and 3 since you have to use 35,000 miles for the exact same award seat that you could get for 9,000 Avios, but it might make sense for people who aren’t in Miami. For example, British Airways if you fly from Seattle to Cancun via Phoenix costs 35,000 miles. This is exactly the same amount as if you booked with American Airlines miles. So if you are a long way from Cancun, then this option might be equal to the Avios option. Shop online with the British Airways online mall. If you have read our article about How to Make Mega Miles with Shopping Portals, then you know how just by shopping online you can earn miles. You just need to earn 9000 Avios to have enough for a round trip ticket from Miami. Here is a chart of some of the merchants they work with (but there are a bunch more!) 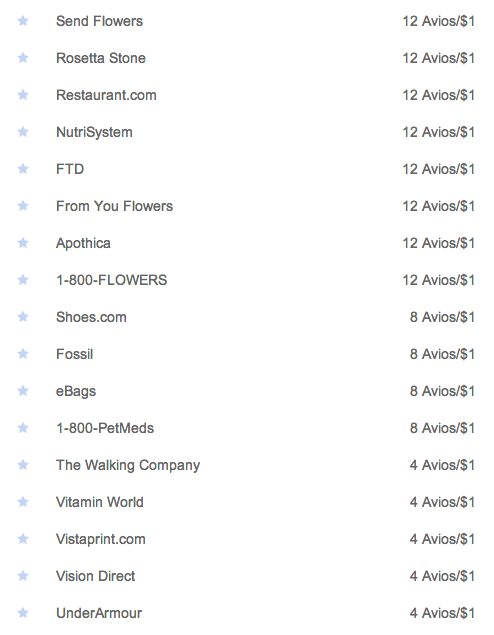 $1125 at Shoes.com, $1125 at 1-800-Petmeds or $750 in flowers or Rosetta Stone can get you enough Avios to go to BPM! There you go, 5 things you can do now to go to BPM next year. Next year, this could be you! Author John ButlerPosted on January 9, 2014 October 27, 2014 Categories American Airlines AAdvantage, Barclays Arrival Mastercard, British Airways Avios, Chase British Airways, Chase Sapphire Preferred, Citibank AA Platinum Personal Mastercard, No Credit? No Problem!, Online Shopping1 Comment on 5 things you can do NOW to go to the BPM Festival for free. 100,000 Avios Miles with the British Airways Visa! Have you liked TravelWithMiles on Facebook yet or followed us on Twitter? Make sure to do it today so you don’t miss any of our great deals to travel the world! Chase has brought back the very popular 100,000 Mile British Airways card. I took advantage of this offer a few years back and used the miles to take a business class trip to Machu Picchu, Easter Island, and Santiago, Chile! The current offer, gives you 50,000 Avios (the British Airways miles) after you spend $2000 in first 3 months, then 25,000 more when you spend $10,000 within the first year, then a further 25,000 when you spend $10,000 more within the first year. $20,000 is a fair amount of spend in one year, but there are a number of ways to get qualified spend without necessarily spending the money. If you follow the advice in that article you could get the whole 100K bonus in as little as 4 months without really spending much! The card has several great features, including a number specifically for international travel. First, it has no foreign transaction fees. Most credit cards tack on an extra 3% onto any charge not made in US Dollars so if you use those cards for international travel, you effectively just spent 3% more than you would with this card. Second, it has smart chip technology for use in Europe. Many European merchants won’t accept charges that don’t include a physical chip on the card. This is one of the only US available cards that has this technology available. You also earn 1.25 Avios for each $1 spent on the card and 2.5 Avios for each $1 spent with British Airways. Another great feature, particularly if you are going to go for the full 100,000 Avios bonus, is if you spend $30,000 in a calendar year you get a travel together ticket which allows a companion to travel with you on either a paid or an award ticket if they just pay the taxes. It is a bit limited in that it has to be on British Airways flights only(which have high fuel surcharges) but especially if you are planning on using your Avios for a flight to Europe in business class, it can provide a good value. And if you spend $20,000 in the first year to get the full 100,000 Avios bonus, you are 2/3 of the way to the free ticket so it might make sense to go ahead and complete the extra spend. See this link for details on the travel together benefit. What could you use 100,000 Avios for? 5 round trip tickets to Colombia from Miami (or vice versa)? 11 trips to Cancun, Mexico from Miami? Since British Airways uses a distance based chart, the best way to get value is by finding trips that are normally expensive tickets but are not that far from each other. Here is a link to a calculator that will tell you how many Avios are required for a city pair. There is an annual fee of $95 that is assessed immediately, but trading $95 for 100,000 Avios is something I would do all day long. So what are you waiting for, click here to sign up for the Chase British Airways Visa and start planning your trip! I also updated the Top Credit Card page with this new offer. Author John ButlerPosted on November 7, 2013 December 2, 2013 Categories British Airways Avios, Chase British AirwaysLeave a comment on 100,000 Avios Miles with the British Airways Visa! 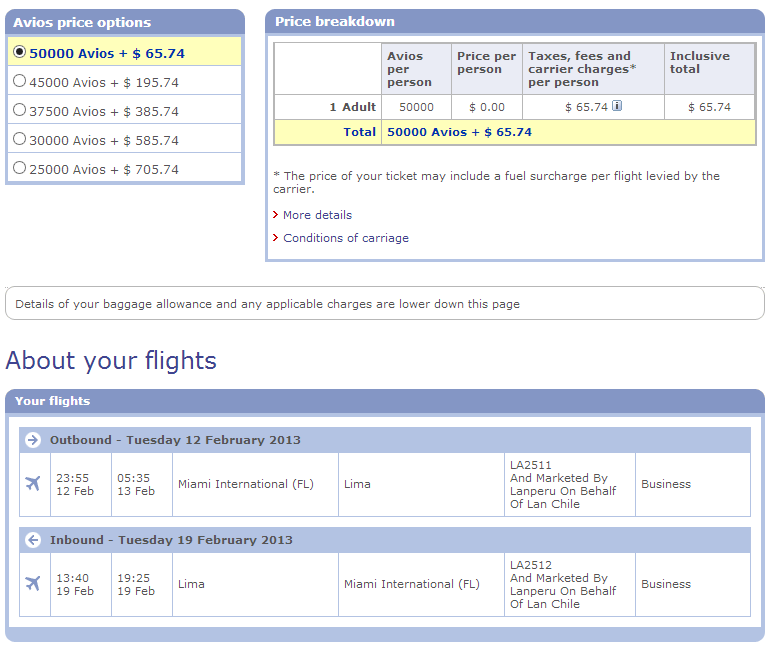 How I am going to Inti Fest in Peru in Business Class for only $65! This is the first post in a series about my trip to Inti Fest 2013 in Peru. For the last two years, my friend Diego has been trying to convince me to come to Asia Beach in Peru for the largest music festival in that country. He is the type of guy that when he says “Trust me, it will be an amazing time”, he really means it. 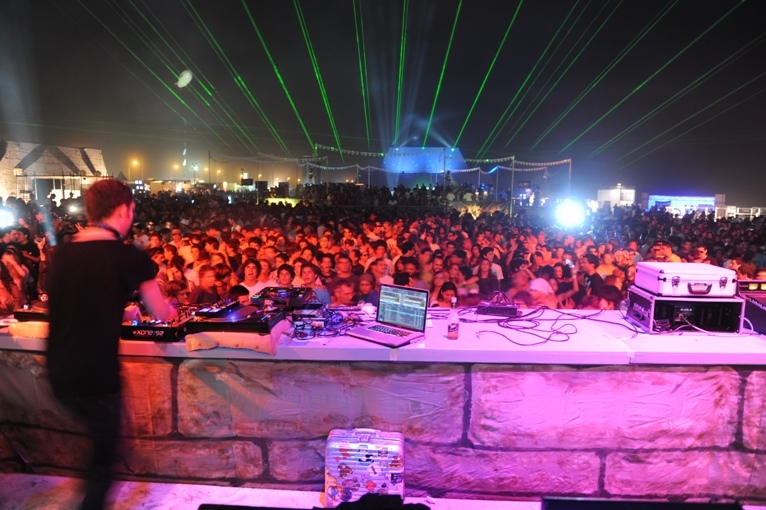 As a festival that is described as “an ecological and cultural electronic music festival that celebrates music, appreciation of Peruvian culture and the environment,” it certainly sounded interesting. Plus being able to get some of the best ceviche in the world while I was there didn’t hurt! I have been to Peru twice before and had explored Lima and Machu Picchu, but had never made it to the Asia Beach area one hour south of Lima where my friends from Miami claimed the great beach parties were. The DJ lineup for this festival was pretty nice as well. But as those who know me would say, I only like doing things when I get a deal so when I looked around at the Wandering Aramean’s page to compare different frequent flyer options I saw that one of my favorites, British Airways was the best choice with a rate of 50,000 Avios points for business class. Since it is almost a 5+ hour flight from Miami, I definitely wanted business class if possible. United Airlines was a hefty 20,000 miles more so I wanted to get the flight with Avios if possible. Remember that you can book using Avios on any Oneworld carrier which means that I could use them for American Airlines and LAN Peru flights, both of which service this route. The problem was, as happens often, was that there was no availability when I went to book around a month before! However, I know if you can be flexible, the airlines often release more frequent flyer seats when it gets close to the travel dates. It is better to put a frequent flyer in a seat than have it go empty. So I actually thought I wasn’t going to be able to go, but I kept checking periodically to see if they released any seats. Low and behold, as I checked a week before the festival, I saw a bunch of seats pop up. But the only ones that worked to attend the festival were leaving a little bit earlier than I had planned, just three days from when I saw them! But if you have some flexibility then these last minute trips can be some of the most rewarding. When I checked on British Airways site, this is what I found! So for 50,000 Avios Points plus $65, I was on my way! I still had a few Avios left over from my 100,000 Visa I got with them, but transferred some from the 264,000 I got into my Ultimate Rewards Sears shopping adventure. And just like that, I was booked! Awesome music, great ceviche, seeing a part of Peru I have never seen before, and spending time with friends: what can be better than that? Author John ButlerPosted on February 12, 2013 June 20, 2014 Categories British Airways Avios, Chase British Airways, How I Am, Inti Fest 2013, Lima1 Comment on How I am going to Inti Fest in Peru in Business Class for only $65! How I paid $5 instead of $370 for a last minute ticket. I had the unfortunate need to be in North Carolina for a funeral recently and I was reminded of yet another use for frequent flyer miles that you don’t typically think of. I found out on Thursday that I needed to be in Raleigh on Sunday and the flights were priced at $370 round trip from Miami for the last minute travel. I knew that American and United both charged 25,000 miles for domestic award travel. US Air was also an option at a cost of 20,000 miles since I have the US Airways Mastercard which gives a discount of 5,000 miles off of their flights. However, I knew that the cheapest option would probably be to use British Airways miles since they use a distance based chart and the distance from Miami to Raleigh was only 700 miles. As you see from this chart, this meant that it would only cost 15,000 miles and $5 for the security fees. Since British Airways is a member of the Oneworld Alliance, the flight would actually be operated by American Airlines. So I saved 10,000 frequent flyer miles versus booking directly with American for the exact same flights! Even better, British Airways doesn’t charge any fees for last minute bookings like United does so I wouldn’t have to pay any additional out of pocket other than the $5 in taxes / security fees. I still had miles leftover from my 100,000 mile British Airways card that I applied for a few years back that I used for this booking. If you are short on miles though, luckily, BA is a transfer partner of Ultimate Rewards which means all of those miles I get from paying my rent I can transfer to British Airways for bookings like this. You can also use the 50,000 point sign up bonus from the Ink Plus card, the 50,000 from the Ink Bold card, or the 40,000 from the Chase Sapphire Preferred card for BA Transfers. This redemption gave me a value of 2.4 cents per mile which I was happy with. You can get better value by redeeming for business and first class tickets but that doesn’t always meet with your travel needs. Points and miles are about meeting YOUR travel needs and saving you money which were both accomplished in my case. So if you find yourself in the situation of needing last minute airfare for family illness or worse, keep in mind to look at using your miles for an alternative to paying last minute prices. Author John ButlerPosted on January 28, 2013 Categories British Airways Avios, Chase British Airways, Chase Ink Bold, Chase Sapphire Preferred1 Comment on How I paid $5 instead of $370 for a last minute ticket. Since Cancun is only 531 miles in the air from Miami, that means that it is only 9000 miles round trip in economy or 18000 round trip in business class! I went onto the British Airways site and searched availability during the festival dates and found that seats were available in business class. Score! This meant for 18,000 Avios miles and $70, I could go to BPM! I wanted to see what the value of these miles were so I priced out the exact same ticket on Kayak and came up with $739. This gave me a redemption value of $739 / 18000 = $0.04 per Avios point, which I thought was a good value. Since it is only a 2 hour flight, I actually probably would have booked the economy for 9000 if it was available, but it wasn’t on the dates I needed. Avios can be some of the best values for short haul flights around the world because many times the airlines gouge you on pricing. If you want to check how many Avios it requires to get to different city pairs, check out this nice “How Many Avios do I Need” page on BA’s site. Another useful tool is the GCMap.com where you can find out the distance between two cities or view a map of everything within a certain distance of a city. Here is a map of 650 miles from Miami. So anywhere within that circle would be only 9000 Avios round trip in Economy! Since British Airways is a transfer partner of both Membership Rewards and Ultimate Rewards, that means you can also get Avios from your Chase Ink Bold or Chase Sapphire Preferred cards or your American Express Business Gold Rewards we have written about in the past. British Airways miles can be very valuable if used correctly and if you don’t have some, you should get some so you can come travel with me! As always feel free to comment with any questions. British Airways 100K Avios offer is back! The British Airways 100,000 Avios offer has been gone for several months, but a link just resurfaced that gives a total of 100K of them. The only trick is you do have a pretty stiff spend requirement to get the miles but they do give you time. 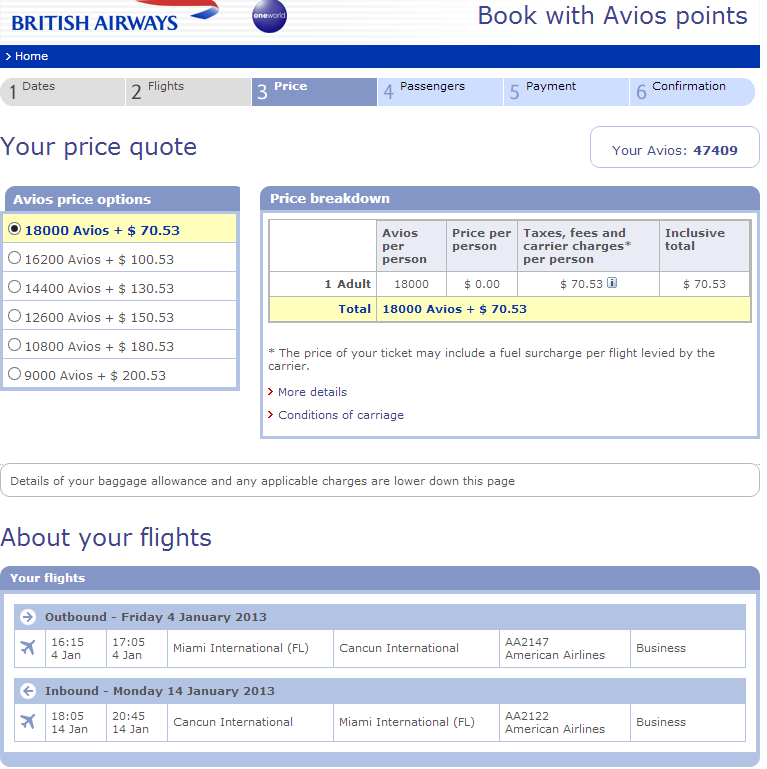 The offer is for 50,000 Avios (BA’s version of frequent flyer miles) after spending $1000 in the first 3 months. Then 25,000 more after spending $10,000 in the first year. Then another 25,000 after spending another $10,000 in that first year. I know $20,000 sounds like a lot to spend to get all the Avios, but with some of the prepaid cards opportunities currently available and Kiva Loans it is a lot easier to meet than you might think without breaking your budget. Anyone I know can at least meet the 50,000 Avios spending of $1000 though so even if you screw up and don’t meet the bigger spend requirement, 50,000 is still a nice amount. Check out our full review on this card here for all the goodies, but these cards can be super valuable for short distance trips. 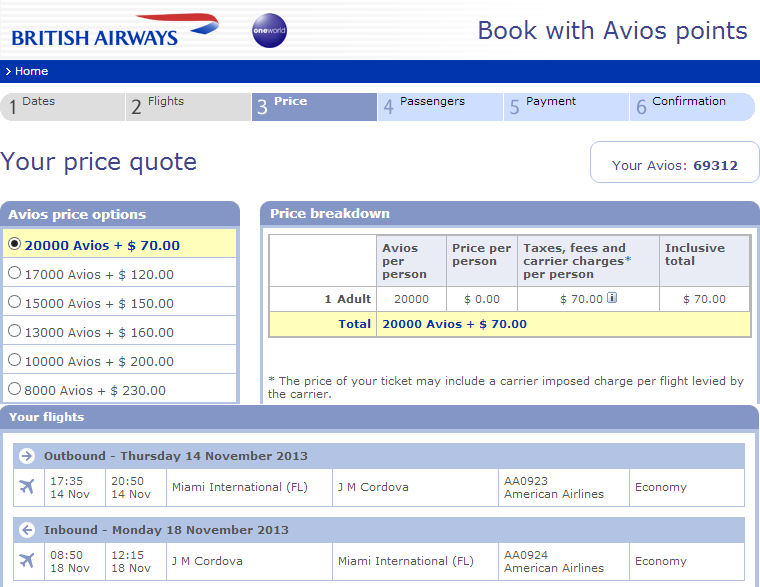 Think about Miami to Cancun for 9000 Avios round trip for instance! I found out about this via a Million Mile Secrets post so a hat tip goes to them! Author John ButlerPosted on November 29, 2012 November 29, 2012 Categories British Airways Avios, Chase British Airways2 Comments on British Airways 100K Avios offer is back! The fabulous 100,000 Mile British Airways card is back for a limited time! Update: This great offer has now been deactivated. You may still be able to get a 100K offer by following the steps in this flyertalk post. 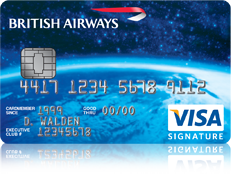 Chase has brought back the very popular 100,000 Mile British Airways card. I was able to take advantage of this offer last time it was offered and used the miles to take my recent business class trip to Machu Picchu, Easter Island, and Santiago, Chile. The requirements are a bit higher than when I took advantage of the offer, but with proper spending and planning, it is still quite doable. The current offer, which expires June 7 (currently extended until some future date), gives you 50,000 Avios (the British Airways miles) after your first purchase, then 25,000 more when you spend $10,000 within the first year, then a further 25,000 when you spend $10,000 more within the first year. $20,000 is a fair amount of spend in one year, but there are a number of ways to get qualified spend without necessarily spending the money. In a future article I will be going over several of the techniques I use to help meet the spend requirements. Another great feature, particularly if you are going to go for the full 100,000 Avios bonus, is if you spend $30,000 in a calendar year you get a travel together ticket which allows a companion to travel with you on either a paid or an award ticket if they just pay the taxes. It is a bit limited in that it has to be on British Airways flights only(which have high fuel surcharges) but especially if you are planning on using your Avios for a flight to Europe in business class, it can provide a good value. And if you spend $20,000 in the first year to get the full 100,000 Avios bonus, you are 2/3 of the way to the free ticket so it might make sense to go ahead and complete the extra spend. There is an annual fee of $95 that is assessed immediately, but trading $95 for 100,000 Avios is something I would do all day long. So what are you waiting for, click here to sign up for the Chase British Airways Visa and start planning your trip! Author John ButlerPosted on May 17, 2012 July 25, 2012 Categories British Airways Avios, Chase British AirwaysLeave a comment on The fabulous 100,000 Mile British Airways card is back for a limited time!